MORE than 2000 years ago, a Messianic cult hid out in the hills above the Dead Sea, waiting to be joined by angels for the final battle against evil, preparing for the "War of the Sons of Light with the Sons of Darkness." Fearing the Romans would destroy the last remaining copies of the Bible, this small group of ancient Israelites hid hundreds of parchment scrolls in the caves of the sheer desert cliffs. In 1947, a Bedouin shepherd boy threw a stone into one of the caves, and heard the sound of pottery breaking. Inside the broken urn he found the oldest known copy of any book of the Bible. I climbed those cliffs days after I first learned that the Bible, proven by the Dead Sea Scrolls to be at least 2000 years old, concealed a computerized code that foretold events that happened thousands of years after the Bible was written. I sat for hours at the top of the barren mountain, looking out over the bleak landscape that had not changed in the millennia since the cult encamped there waiting for the End. The next day, I went to the Shrine of the Book in Jerusalem, and saw on display the most ancient prophecy of the Apocalypse, the 2500-year-old Isaiah scroll. The entire original text of Isaiah, found intact in those caves above the Dead Sea, was now wrapped end-to-end around a huge drum that stood on a pedestal, over a deep open well in the center of the domed museum. Why, I wondered, was the scroll displayed in this unique way? I called Armand Bartos, the architect who designed the museum that now housed the Dead Sea Scrolls. "It was originally designed so that the drum could automatically retract, go down to the level below, and be covered over by steel plates," said Bartos. "It was done to protect the earliest copy of the Bible known to the world," he said. No one yet knew that in the ancient scroll, wrapped around the huge drum, mounted on a device designed to withstand an atomic bomb, was a hidden warning that Jerusalem might, in fact, be destroyed in a nuclear attack, an "atomic holocaust" that might trigger a "World War," the real Armageddon. The secret was in a "sealed book." Isaiah describes a terrible Apocalypse yet to come, a truly frightening vision of a future war, and then states: "For you this whole vision is nothing but words sealed in a book." It is the first reference to the secret "sealed book" in the Bible. It is a vision of our future that was hidden, first in a cave, and then in a code that no one could decipher until the computer was invented. At first, states Isaiah, no one would be able to open the "sealed book": "And if you give the book to someone who can read, and say to him, `Read this, please,' he will answer, `I can't, it is sealed.'" But finally, Isaiah predicts, the "sealed book" will be opened: "On that day the deaf will hear the words of the book, and from the gloom and the darkness the eyes of the blind will see it." And in the hidden text, the same verses of Isaiah reveal that the sealed book is the Bible code: "He recognized the words, they will be computerized, his report they heard on this day, the secrets, the magical words of the book." The 2500-year-old warning of a nuclear war could be found only with a computer. And now the Bible code revealed when and where the real Apocalypse might begin. I checked every year in the next hundred years. Only two years, 2000 and 2006, were clearly encoded with "World War." The same two years were also encoded with "atomic holocaust." They were the only two years in the next hundred encoded with both "atomic holocaust" and "World War." There is no way to know whether the code is predicting a war in 2000 or 2006. The year 2000 is encoded twice, but 2006 is mathematically the best match. And there is, of course, no way to know if the danger is real. But if the Bible code is right, a third World War by the end of the century is at least possible, and a World War within the next ten years is a probability we cannot ignore. "Atomic holocaust" and "World War" are encoded together. The next war, according to the code, will be fought with weapons of mass destruction the world has never seen used in battle before. World War II ended with Hiroshima, but now there are at least 50,000 nuclear weapons, from atomic artillery shells to multi-warhead ballistic missiles. Each can destroy a whole city. The whole world could be obliterated within a few hours. World War III would literally be Armageddon. THE warning of when and where and how our world might face the real Armageddon, a nuclear World War, was hidden in the most sacred verses of the Bible 3000 years ago. When we opened the "sealed book" to search for World War III, we discovered that the year it might begin was foretold in a twenty-two-line scroll that is central to the Bible. The scroll is called the "Mezuzah." It contains the 170 words that from all the 304,805 words of the original five books of the Bible God commanded be kept in a separate scroll, and posted at the entrance of every home. "In 5760" and "in 5766," the years 2000 and 2006, are encoded in those 170 words. "World War"-the only time it is encoded in the entire Bible-appears in the same place, and crosses one of the sacred verses. "Atomic holocaust"-the only time it is encoded in the Bible-also appears with the same two years in the same two verses of the scroll. "And these words, which I command thee this day, shall be in thy heart; and thou shalt teach them diligently to thy children, and shalt talk of them when thou sittest in thy house, and when thou walkest by the way, and when thou liest down, and when thou risest up. And thou shalt bind them for a sign upon thy arm, and between thy eyes. And thou shalt write them upon the doorposts of thy house, and on thy gates." The years World War III might begin were revealed in the most carefully saved words of the Old Testament. 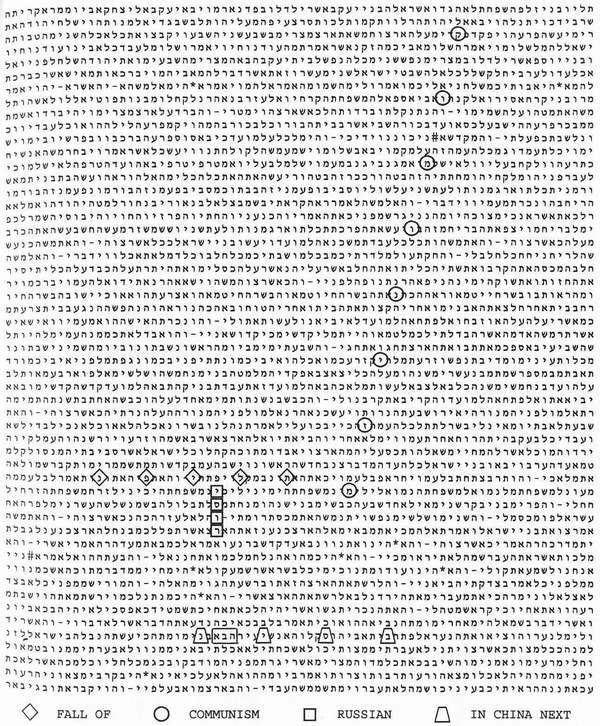 And where the years 2000 and 2006 are encoded, the hidden text of the sacred scroll warns of war: "It will bombard your country, terror, devastation, it is being launched." It could not be by chance that the warning of when the world might face a nuclear war was encoded in two of the fifteen verses of the Bible that Godtwice commands be memorized, taught to the children, and recited every day and every night. It could not be by chance that the years most clearly encoded with "World War" were both hidden in the 170 words that were saved in a separate scroll for 3000 years, and are still today fastened on the doorway of nearly every home in Israel. If even one letter is missing, a Mezuzah cannot be used. Someone wanted to make absolutely certain, no matter what happened to the rest of the Bible, that these words, this scroll was preserved, exactly as originally written, with its hidden code intact. And that ancient code, which now predicted that World War III could start within a decade, also had predicted that World War II would start "in 5700"-in the modern calendar 1939-1940. 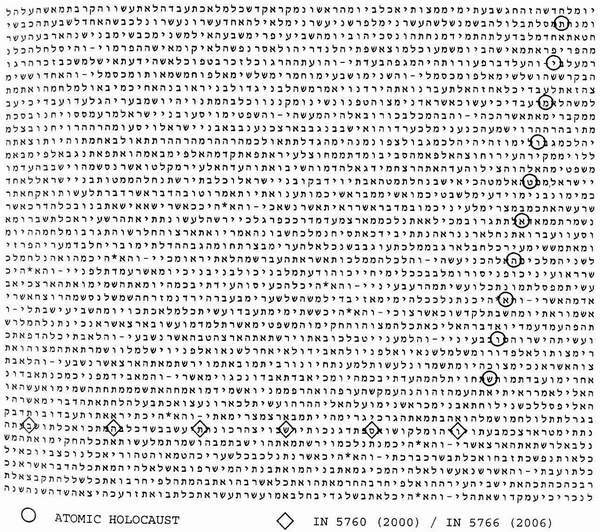 "In 5700, the cremator came," states the full hidden text, predicting not only the war, but the ovens of the Holocaust. Armageddon in the years 2000-2006 was the warning encoded in the same sacred verses of the Bible, the carefully preserved code in the Mezuzah that so accurately foretold the last World War. INSTEAD of a nuclear war between superpowers, the world may now face a new threat-terrorists armed with nuclear weapons. "Terrorism" is encoded with "World War," and right below "third" appear the words "war to the knife." It suggests a war of total annihilation. It is clearly encoded with "atomic holocaust." The sudden collapse of the Soviet Union changed the world. It removed America's chief adversary, but made the world's biggest stockpile of nuclear weapons available to terrorists. A U.S. Senate committee last year confirmed the danger. "Never before has an empire disintegrated while in possession of 30,000 nuclear weapons," the vice chairman, Senator Sam Nunn, stated. Calling the former Soviet Union a "vast potential supermarket of nuclear, chemical, and biological weapons," Senator Richard Lugar warned that "the probability that one, two or a dozen weapons of mass destruction detonating in Russia, or Europe, or the Middle East, or even the United States, has increased." "The fall of communism" was foretold in the Bible code. The only time the word "communism" appears at all, "the fall of and "Russian" are encoded with it. "China" is encoded just below. Intertwined with "in China" is a prediction-"next." To many in the West, the collapse of the Soviet Union was seen as a victory. The end of communism in China would be seen as a final triumph. But chaos in another nuclear power would also increase the risk that weapons that can destroy whole cities might be sold to, or stolen by terrorists. 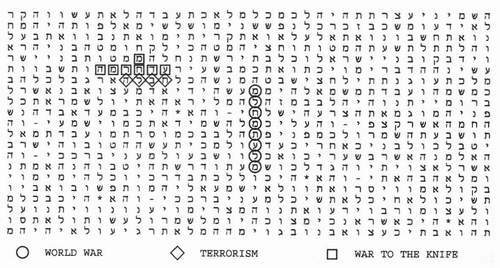 If the Bible code is right, nuclear terrorists may trigger the next World War. It may begin as Prime Minister Peres suggested a few days after I met with him, when a nuclear weapon "falls into the hands of irresponsible countries, and is carried on the shoulders of fanatics." World War II ended with an atomic bomb. World War III may start that way. JERUSALEM, the most fought-over city in history-from the time King David conquered it, and the Babylonians burned it, and the Romans destroyed it, and the Crusaders besieged it, down through 3000 years of bloody conflict that did not end when the Israelis took it back in the 1967 war-is clearly encoded in the Bible as the target of the predicted nuclear attack. Only one world capital is encoded anywhere in the Bible with either "atomic holocaust" or "World War"-"Jerusalem." The name of the city is hidden in a single verse of the Bible. "Jerusalem" is encoded within God's threat to punish Israel down through history-"I, the Lord your God, am a jealous God, punishing the children for the sins of the fathers to the third and fourth generation of those who hate me." "Your city to be destroyed by an act of terrorism" crosses "atomic holocaust." And the target is confirmed in the most ancient prophecy of the Apocalypse, the one found intact among the Dead Sea Scrolls, the 2500-year-old Book of Isaiah. "Suddenly, in an instant, the Lord Almighty will come with thunder and earthquake and great noise, with windstorm and tempest and flames of a devouring fire." It is an extraordinarily accurate vision of an "atomic holocaust," as foreseen thousands of years ago, expressed in the only words an ancient seer could use to describe it. Compare it to a modern description of the atomic bombing of Hiroshima: "The whole city was ruined instantly. The center of the city was flattened. Half an hour after the blast fires set by the thermal pulse began to coalesce into a firestorm, which lasted six hours. For four hours at midday, a violent whirlwind, born of the strange meteorological conditions produced by the explosion, further devastated the city." The words that seem to echo Isaiah are from Jonathan Schell's classic account of the 1945 bombing in The Fate of the Earth. No one in Hiroshima heard the explosion. The blast created a vacuum. But miles away there was a tremendous noise, a terrible "thunder" unlike anything heard before. The Hiroshima bomb was exploded in the air, almost 2000 feet above the city. If a nuclear bomb were exploded on the ground, as it would likely be in any terrorist attack, the horror would be even greater. The entire population of a city would instantly be reduced to dust. Again, from Schell: "Any human being in the area would be reduced to smoke and ashes; they would simply disappear. The incinerated population, now radioactive dust, would rise up into the mushroom cloud, then fall back to the ground." Now listen again to Isaiah: "Brought low, you will speak from the ground, your speech will mumble out of the dust, your voice will come ghostlike from the Earth, out of the dust you will whisper. And your many enemies will become like fine dust, the ruthless hordes like blown chaff. It will happen suddenly, in an instant." It is an odd description of an ancient siege, but a perfect vision of the aftermath of a nuclear strike and counter-strike. And then there is the curious, cryptic passage: "For you this whole vision is nothing but words sealed in a book." They remained sealed, until now, revealed by a code that may exist to warn us at the critical moment of the impending atomic attack. "Atomic weapon" is encoded in Isaiah. The "m" in "atomic" is also the "m" in "Jerusalem." Where "Jerusalem" crosses "atomic weapon," so does the word "scroll." And overlapping "scroll" are the words "he opened it." 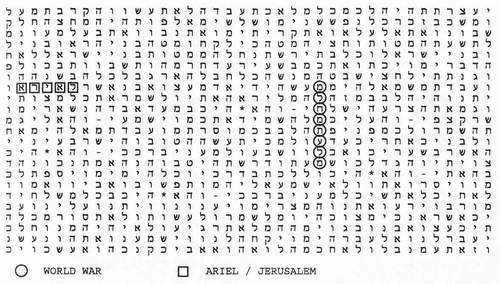 And the ancient name for Jerusalem, "Ariel," the name used in Isaiah's warning of the Apocalypse, is encoded with "World War." 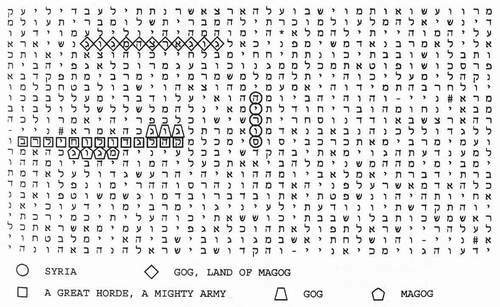 The long-known Biblical prophecy of Armageddon seemed to be confirmed by the Bible code. Jerusalem, the center of the Western world's three major religions, the fabled city where David ruled, where Jesus died, where Mohammed ascended to Heaven, might be obliterated in a final battle brought on by religious hatred. The real Armageddon could be a nuclear World War. I had never believed the Apocalyptic prophecies of the Bible. I never believed that God or the Devil would destroy the world, or that the forces of good and evil would clash in a Final Battle. But the Bible code's statement that the final battle, Armageddon, could begin in the Middle East with an act of nuclear terrorism seemed all too real. The word "Armageddon" comes from the last book of the New Testament, in a verse that seems fanciful: "The spirits of devils, working miracles, go forth onto the Kings of the Earth and of the whole world, to gather them to the battle of that great day of God Almighty. And he gathered them together into a place called in the Hebrew tongue Armageddon." But Armageddon is a real place. It is the Greek name for an ancient city in Israel, Megiddo. In Hebrew, "Mount Megiddo" is "Harmegiddo." "Armageddon" is simply the Greek transliteration of that name. I went there late one night. I was driving back to Jerusalem, and saw a green and white highway sign with a name that I had seen before only in the Bible, "Megiddo." It was past midnight, but I stopped to see the ruins of the fortified city. It seemed inconceivable that this remote place would ever really be the site of a major battle. But near Megiddo, hidden to tourists, is one of Israel's most important Air Force bases, Ramat David. It is in the north, facing Israel's implacable foe, Syria. It would be on the front lines of any real war in the modern Middle East. "Armageddon" is encoded in the Bible with the name of Syria's leader, Hafez Asad. In fact, the name of the actual site of the long-prophesied Final Battle appears with his name in a single skip sequence: "Armageddon, Asad holocaust." "Syria" is encoded with "World War." It is the country that stands out, because it is not expected. "Russia" and "China" and "USA" all also appear with "World War." But they are the three superpowers most likely to be involved. "Syria" is the surprise. But if Armageddon is real, it may begin the way it is prophesied in the plain text of the Bible. The last book of the New Testament predicts a final war of unprecedented fury: "Satan shall be loosed out of his prison, and shall go out to deceive the nations in the four quarters of the Earth, Gog and Magog, to gather them together to battle." No one knows where the ancient "Gog and Magog" were located. But the original prophecy of the Final Battle, told in Ezekiel, is that Israel will be invaded from the North: "You will come from your place in the far north, you and many nations with you, a great horde, a mighty army." The only modern enemy north of Israel is Syria. "Syria" is encoded in Ezekiel, starting in the verse that predicts the invasion. Syria's allies are named: "Persia" and "Phut," countries that are now called Iran and Libya. The plain text of Ezekiel predicts a terrible battle between Israel and the surrounding Arab nations, "a great slaughter on the mountains of Israel." According to the Bible code, that is how World War III might begin with an atomic attack on Jerusalem, followed by an invasion of Israel. AT the same museum in Jerusalem where the Dead Sea Scrolls are on display, where the original vision of the Apocalypse was mounted on a device designed to withstand an atomic attack, there is another exhibit. The original manuscript of Einstein's Theory of Relativity, and the equation that changed the world, that started the atomic age- E = mc2 - is shown there in the scientist's own handwriting. But what really caught my attention was something else Einstein had said: "I do not know with what weapons World War III will be fought, but World War IV will be fought with sticks and stones." At the close of the twentieth century, we are threatened with a kind of chaos that the world has never faced before. We have built weapons that can destroy human civilization in a single day, and those weapons may now be on the loose. 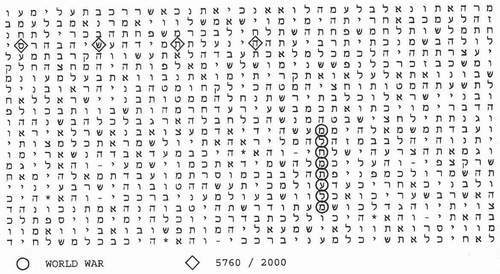 The predictions in the Bible code seem to fulfill the open prophecy of the Bible, and the horror is now given a face and a time and a place-a nuclear World War, perhaps by the year 2000 or 2006, the real Armageddon, perhaps within a decade. And that is not the end of the predicted danger.